News from July 2018 to June 2019. Click "Buzz Home" button on horizontal navigation bar to navigate to Buzz for a different year. The "Subscribe to posts" link below may be used to add the Club Buzz news feed to an RSS reader. Please ignore if you do not use an RSS reader. The April 2019 Program guest is Barb Templin, a member of the Bella Vista Garden Club. The topic of the program is Spring Planting for Fall Color and photos are shown of many plants other than the usual mums and pansies that give us wonderful fall color. A variety of shrubs, grasses and perennials give us fall color as a bonus. There are even some hostas that turn yellow before they lose their leaves in the late fall. A plant that gives fall color next to an evergreen will give your garden good color variety. 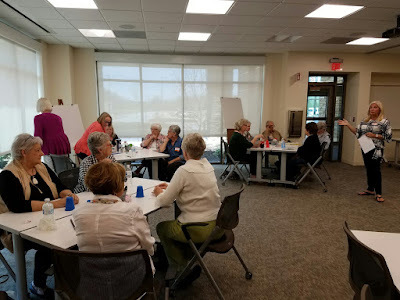 A focus retreat was held in the Community Room at Mercy Clinic at One Mercy Way in Bella Vista on April 5th from 1 - 4 p.m. President Judy Jeffrey presided over the meeting and twenty-five members attended, divided into small discussion groups. Comments of each group were recorded on large flip charts that could be viewed by all. Kim Carter (left photo, far right) was the facilitator for the retreat. Later, the president and the facilitator plan to summarize the input and report to the Executive Board and the BVGC membership on further measures to improve projects and club efforts to support the stated purpose of the club. Well, we hit a home run again! The card party was a smashing success. Helene Elliot and her co-chair Marion Heath put together an event that was enjoyed by all. I did not see anyone leave the party without a smile on their face. Of course, the kitchen station captains and helpers plus everyone who brought food must be commended. I heard time and time again "I love this card party because the food is always good!" Then there are all the other volunteers, Beth Kastl for putting together gorgeous raffle baskets, the individuals who set up, cleaned, sold tickets, etc. The best news is we took in funds for scholarships and it was an event that was enjoyed by the community. Thank you to the our Local Businesses and Citizens for their Contributions. Lunch: Baked Potatoes with all the trimmings, veggies, and deserts. 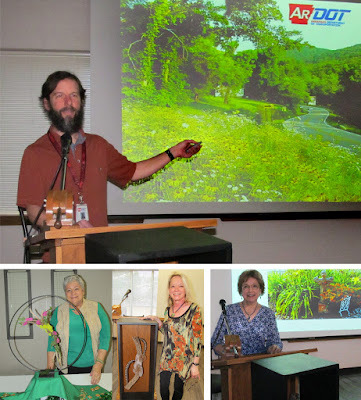 Program: Joe Ledvina, AR Department of Transportation, presented information on the "Wildflower Program" He talked about preserving native plants during construction projects. Efforts include designated ‘Wildflower Routes’, replacing original top soil, reducing herbicide use, adapting mowing practices, and expanding wildflower populations through native plant seeding programs. (left top). Floral Design Workshop: Linda Neymeyer discussed "Hanging Designs" and showed Char Brunji's design (lower left) and her own design (lower center). 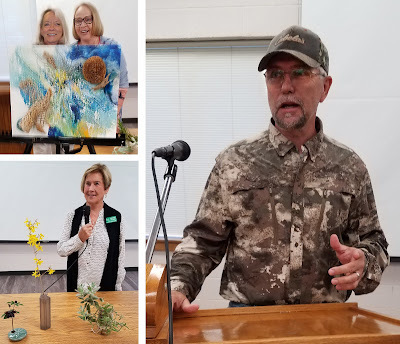 Cathy Wayson presented a program on the specifications for the new addition to the October 1st Flower Show - "Botanical Art Photography" (lower right). March Gardening Program now on Youtube. The March 2019 Program guest is Ann Iwen, a member of the Bella Vista Garden Club. The topic of the program is Orchids from Around the World and photos are shown of many orchids used as houseplants. These tropical plants are native to every continent except Antarctica and thrive in warm and humid conditions. Several examples of blooming Phalaenopsis are shown which were supplied by Lou Jasper, fellow member of the Bella Vista Garden Club. Planting medium, fertilizing and watering instructions and hints are given. 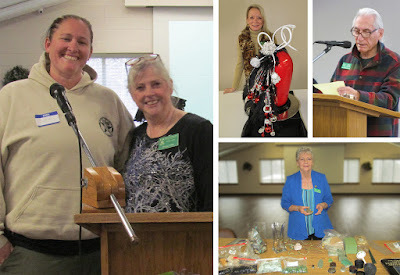 Program: "Women's Program at Sheriff's Department" was given by Deputy Dwyer and Master Gardener, Phyllis Stair, below left. Floral Design Workshop: Linda Neymeyer - "Cascade Designs and Geri Hoerner - "Mechanics of Floral Designs". Horticulture: Tony LiCausi - "Rocks and Slopes". the Club enjoyed a lunch buffet followed by the lovely singing of the Bentonville Chamber Choir.